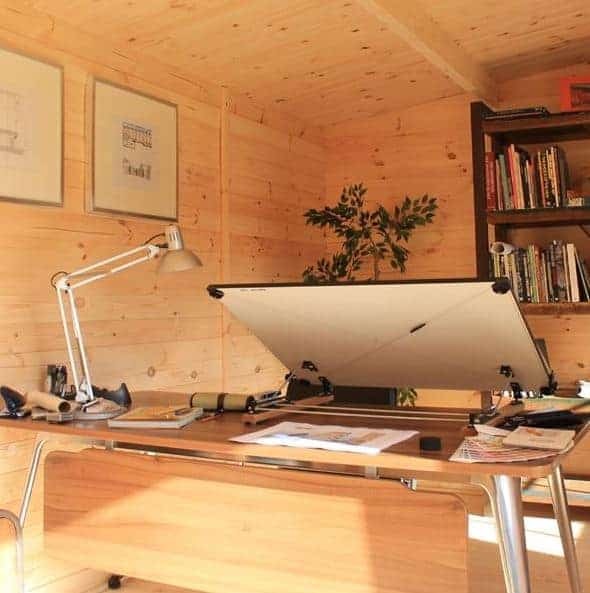 Though this very stylish cabin has been built as an executive home office, it could be used for many other purposes too. It is a very solid, high quality building that oozes elegance. 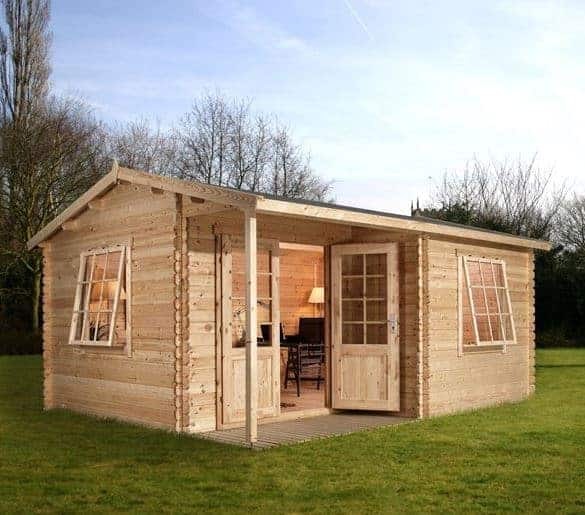 Providing you have the space available, this is guaranteed to look fantastic in your garden. There are two large windows with a great panelled design. As standard they are fitted with single glazing, though double glazing is available. The double doors also have a glazed design, so the level of light that enters the cabin is great. On the doors you’ll also see they contain a mortice lock and key. So security isn’t an issue. The cladding has been constructed from slow-grown Baltic pine. This is largely what gives the building such a stunning look and feel. It has a smooth finish and you can tell a lot of effort has been placed into making this cabin solid and secure. Even the floor and roof come with a super-thick 19mm tongue and groove build. Floor bearers are also added to protect it against rot and moisture issues. Waltons don’t really mention the shaded porch, though this is one of the cabins design elements which makes it really stand out. It provides a perfect area to sit out and enjoy the view as you relax in the hot summer months. Won’t be within everyone’s price range. However, it is worth every penny. 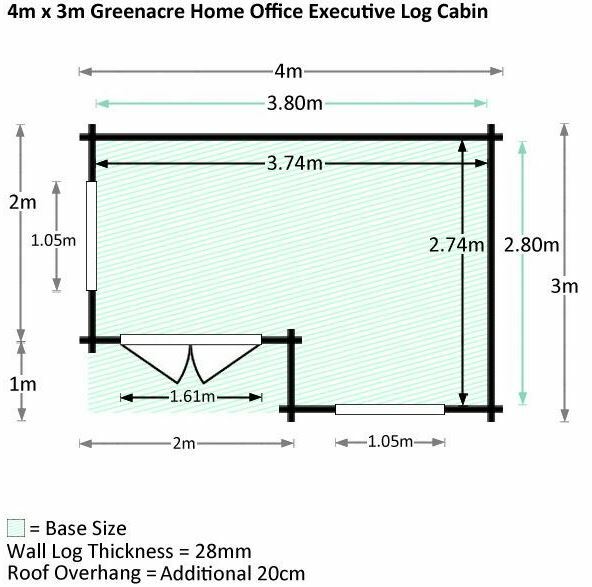 This large cabin is primarily constructed for use as a home office. 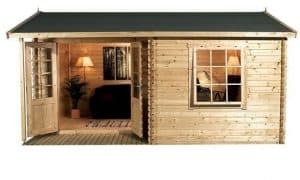 However, the great thing about the Waltons outdoor cabin range is that they can be used for practically anything. Turn it into a games room or an additional living room. Or why not use it as a stylish home gym? Whatever your needs, this building can accommodate them and comes with a very strong, tough build. 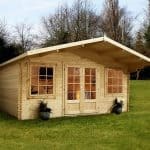 This cabin has a wide design with a fairly compact depth compared to many similar models. However, what is worth highlighting is the very wide double doors. They offer an extraordinary amount of space to enter and exit the building. This really makes adding even large, bulky and heavy furniture a lot easier. Whilst it is a large building, it will fit in medium-large gardens. Though it offers a great amount of height, the cabin doesn’t look too imposing thanks to the gentle sloped design of the roof. Waltons have constructed the roof and floor with tough, long lasting 19mm tongue and groove cladding. The roof has a reverse apex style, though it isn’t as protruding as the majority of apex roofs. It features a very slight diagonal design and it overhangs a lot at the front of the cabin to accommodate the sheltered porch. A large, round support beam stands tall at the edge of the porch way, securing the roof at the front of the building. 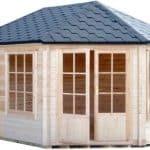 Just like the manufacturers shed collection, this one comes supplied with roof felt. However, this doesn’t provide a very thick protective layer and we would recommend upgrading to the superior felt offered at an extra fee. The floor’s strong build makes it suitable for any type of furniture, heavy gym equipment, and solid wooden desks. It is really constructed to withstand a lot of pressure so you won’t need to worry about it becoming damaged over time. Pine tongue and groove cladding gives the cabin a light, cosy look. It manages to blend traditional and modern, leaving you with an incredible looking building. Tongue and groove is a common cladding type and it offers two main benefits. These include easy installation and great weather resistant features. The panels interlock via a ‘tongue’ located at one end and a ’groove’ located at the other. Even if it is subjected to heavy downpours, no water will leak through. However, it does need to be treated in order for you to benefit from proper water resistance. Another thing that makes tongue and groove a lot more reliable than overlap is the expansion gap included within the buildings structure. You might be aware that softwood can warp when it is exposed to either strong direct sunlight or very heavy rainfall. This basically means the timber can shrink or swell depending upon the conditions it is faced with. A gap is provided so that slight changes in the pine will not affect the rigidity of the cabin. You can actually choose from three different thicknesses. Included in the cost is a pretty rigid 28mm cladding. 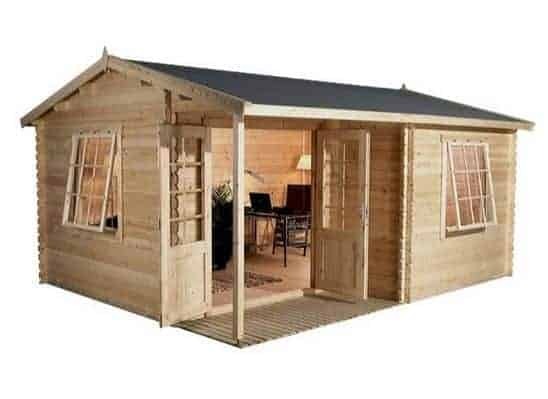 When you compare it to garden sheds and other buildings which typically come with 12mm cladding, you can imagine how much thicker this actually is. The fact you can also add 34mm or 44mm cladding is an exceptional advantage. Whilst the 34mm option will simply upgrade the thickness, the 44mm option adds a double wind tunnel into its design. This means you get an awesome amount of insulation which you will really benefit from in winter. When choosing a cladding thickness, you should also keep in mind that the thicker it is, the more secure and long-lasting it will be. 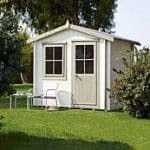 You should treat the cabin as soon as it has been installed and then either annually or every couple of years thereafter. It may be one pretty tough building, but softwood will start to become damaged over time if it isn’t properly weather protected. It will likely be tempting to use a water based treatment. Being the cheaper option, it obviously makes senses to want to try and save as much money as possible because of the size of the cabin. However, in reality you won’t really be saving much money. Spirit treatments are more costly, but they work in a much more effective and deeper way. Penetration within the timber logs means the walls will be protected from the surface, all the way through to the interior part of the wood. This level of protection means you will not have to reapply it annually. So you need to think about whether you want to save maintenance costs or time. As you’re spending a lot of money on the cabin, you’ll want some reassurance it will last. This is given to you via a 10 year anti-rot guarantee. Both the doors and the windows have a very beautiful and traditional design. The double doors come with super-wide measurements to make transporting absolutely anything quick and simple. They are also glazed, just like the windows. However, the thing that makes the doors stand out on this cabin is the fact they are slightly recessed. This is to make room for the small porch area that is shaded by the overhang of the roof. It’s a unique design element that really adds to the building’s aesthetic appeal. They also benefit from a very secure lock and key. As the lock is installed into the door, it is much more secure than an external lock. Two openable, large square panelled windows are located on the front and side of the cabin. 4mm single glass glazing is installed as standard, though you have an option to upgrade to double glazing which comes in a 16mm thickness. As you can see, that’s quite a difference and there are a couple of benefits that come with upgrading. Firstly it will keep the cabin warmer on colder days. Then secondly they will prove more difficult to smash. There’s also an added benefit that you won’t be able to hear as many noises from outside the cabin. This is a pretty important feature when you’re trying to use the building to work in. The windows won’t just be upgraded to double glazing – the doors will be too. Log cabins are a lot more tempting for a potential thief to break into. This is especially true if you’re storing computers and other office equipment in here. Security is actually really good thanks to the mortise style lock and key. The windows lock securely too so you don’t need to worry about anybody getting through them. If you are using the cabin as an executive home office, we would recommend improving the security further. Just like you would with an actual commercial office, we’d advise adding a security system with alarm. This may bump the costs up but it is definitely worth it for the security you receive. As the windows are partially blocked by wooden panelling, it isn’t as easy to peer through them. Obviously though it does pose some privacy concerns. That’s why we’d definitely recommend putting curtains up or blinds. Again these will incur additional costs, but they won’t just help with privacy. If you hang thick curtains they will help to insulate the cabin when it’s really cold outdoors. 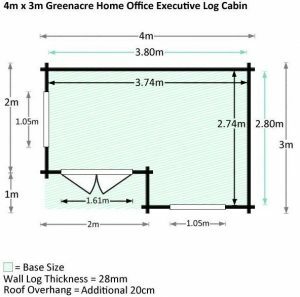 Waltons give you three main options to customise the Home Office Executive Log Cabin. The first is the type of glazing included in the doors and windows. The purchase cost includes single glazing which is 4mm thick. Whilst you should find this fairly adequate at keeping out drafts, the double glazing is worth the extra money. It benefits from a fantastic 16mm thickness, offering maximum insulation and also reducing the levels of noise from outside, which can be a real distraction; particularly if you live in a fairly built up area. 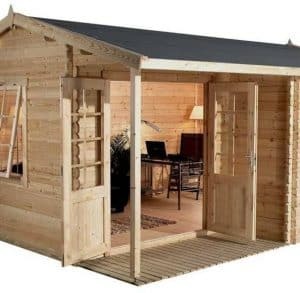 As it insulates the building, it will also help to make working in the cabin much more comfortable in winter. A slightly more expensive upgrade is a choice of thicker cladding. Just like it is provided with single glazing, the cabin also benefits from very thick 28mm tongue and groove cladding. This is pretty impressive and does offer a very good amount of security and weather resistance. However, if you want to make it really comfortable to work in, you should consider the 34mm and the 44mm upgrades. Both of these options will improve the insulation and security of the building, but obviously the 44mm upgrade is the better out of the two. It isn’t just naturally thicker, it also benefits from having a built in double wind tunnel. This means drafts have very little chance of making their way inside the building. You’ll notice you have the option to upgrade the glazing alone, or both the glazing and the cladding together. We should point out if you choose to go for the maximum upgrade of double glazing and 44mm cladding, it will cost an additional £1,109. This is obviously a lot of extra money to spend and won’t be suitable for all budgets. The roof is something else you can upgrade. As you will see, it does come with a very gentle apex design. However, unlike most apex roofs, this one isn’t overly visible. So when choosing whether to upgrade, you should focus on practicality, rather than style. The reason we say this is because one of the upgrade options is the Armourshield shingles. These have the same look as roof tiles and they are technologically advanced. 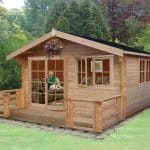 You’ll often see them featured on log cabins for their very attractive design benefits. They do give a very good and effective weatherproof covering, but as they are largely used for decorative reasons, you might want to save money and opt for the superior duty felt instead. The superior duty felt is supplied in charcoal and olive green and it’s strong fibreglass. Unlike mineral felt, this fibreglass won’t deteriorate when exposed to harsh weather. It offers a very efficient waterproof barrier, protecting the roof from rot and other water related damage. To cover the entire roof, it comes in 30m which can be tricky to install. However, as it doesn’t require adhesives, this does make it a little easier. Perhaps the most beneficial extra available with this cabin is the Waltons installation service. Due to the size and weight of the panels, this could be a very useful service to invest in. It may seem a little pricey, but imagine not having to worry about putting the building together. If you choose to do it alone, it would take at least one full day to install, though will likely take even longer. A professional team will come and build the cabin once you have a firm, even base. They not only assemble the cabin, but they will also attach the felt and clean up afterwards. All you need to do is sit back and then enjoy the building. Be aware that this service does not include the installation of any other extras you buy. Whilst they will install the heavy duty felt included with the cabin, they won’t install the shingles if you choose to upgrade. 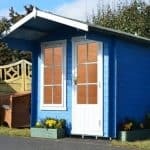 Depending upon which size cladding you buy, the Garden Building insulation kits could be beneficial too. There is a 30 square metre and a 60 square metre kit and both are supplied with everything you need to install it. 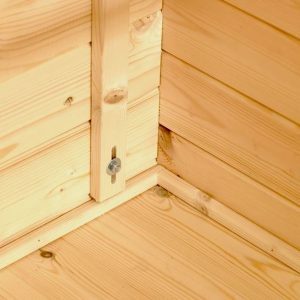 The insulation can be added to the floor, roof and walls of the cabin and each kit is made up of six layers of thermal wadding, along with a water resistant reflective foil layer and breather foam. The only difference between the two kits is the 60 square metre one allows you to insulate more of the building. Finally there’s a non-essential, but useful extra that will provide free, renewable power and light to the cabin. Three different power options are available including 100w, 200w and 400w. The 100w and 200w panels are also available in either free-standing or roof-mounted varieties. Once bought and installed, you won’t have to pay a penny extra for the power supplied so for this reason they are recommended over an electrical pack. Another benefit over electrical packs, other than the long-term costs saved, is that the panels are not connected to the mains. So they aren’t as hard to install. We’re seriously impressed by this log cabin. Not only is it stylish; it is also really solid and incredibly secure. Every last little detail has been crafted to a superb standard. The type of timber used has also been given a lot of thought. Slow grown Baltic sourced pine is one of the highest quality timbers used on outdoor buildings. Despite needing treatments, this cabin will withstand many years of harsh, trying weather conditions. You don’t have to treat it every year as long as you apply a high quality preservative. Being one of the larger cabins in the Waltons collection, this offers a tremendous amount of space. You’ll easily fit 2-3 work desks in here, or it could be turned into a very large additional living room. The sheer level of space gives you all kinds of possibilities in how you can use the cabin. We aren’t going to lie, this cabin is a challenge to build. However, this is mainly down to the weight of the timber. It’s also going to take a very long time to build and we’d suggest leaving at least a weekend to put it all together. Ideally if you have the money we’d suggest you take full advantage of the installation service. All of the hard work will be done for you and any mess will be cleaned away afterwards. Even if you end up spending a lot of money on customising and upgrading the cabin, you’re still going to receive excellent value for money. You only have to read customer reviews to see that most are extremely happy with the value provided. It’s a stunning building with a long lasting and superior quality design. Final Thoughts: If you work from home, this executive designed log cabin is a fantastic place to work. Whether you opt for its standard build, or you choose to upgrade; you are guaranteed a long-lasting, super quality building. 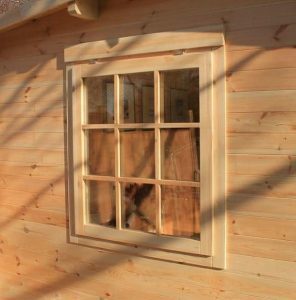 Slow grown Baltic pine gives the cabin a sensual look and it also feels really smooth. So you won’t need to worry about splinters. Some of its best features include attractive, openable windows, extra-wide double doors and a small porch area which you can sit out on in the summer months. It is a secure cabin and although it comes at an initially high cost, we feel it is worth every single penny.